Obituary for Steven Shane Slater | Langeland Family Funeral Homes, Inc. Passed away unexpectedly on Friday, February 23, 2018 at the age of 63. Steven was born in Kalamazoo on September 28, 1954, the son of the William Slater and the late Ellen Brooks Slater. He was active in helping to raise funds for the American Cancer Society, participating in many Relays for Life. He enjoyed volunteering with the Animal Rescue Project in Kalamazoo. 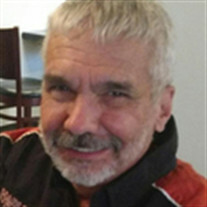 He loved motorcycles and was a member of the Harley Owners Group, "HOG". He is survived by his loving wife of 37 years, Michele Ann (Monczynski) Slater; three children, Joshua (Angel Nocis) Slater, Lindsey (Bret) Borock and Brittany (Shaun) Rutgers; one sister, Susan Gonser; one sister-in-law, Joyce (Bob) Elliott; nieces and nephews, Steven (Tracy) Quada, Paul (Karen) Quada, Heather Elliott and Brent Elliott; and one great-nephew, John Elliott. Steven will also be greatly missed by his beloved dog J.W. In accordance with Steven's wishes, cremation has taken place. Friends may visit with the family from 12 - 1 p.m. on Tuesday, February 27, 2018 at the Langeland Family Funeral Homes, Memorial Chapel, 622 S. Burdick St., Kalamazoo, MI 49007. The memorial service will follow the visitation at 1 p.m., with David Mitchell officiating. In lieu of flowers, memorial contributions may be given to the American Cancer Society or Animal Rescue Project.